It is quite easy to have a lovely mixed planting scheme in full flower in June when the roses are out, but I feel the trick is to extend the interest in these borders for as many months either side of June as possible. Last month I discussed the structural and ground cover plants which work in the beds for many months of the year, this month I shall cover some of the plants that I have used in the rose garden to make it floriferous and of interest from spring to autumn. I mentioned the grape hyacinths that start the blue and citrus green theme of Spring in the rose beds previously, blending with the Euphorbia characias subsp. wulfenii. 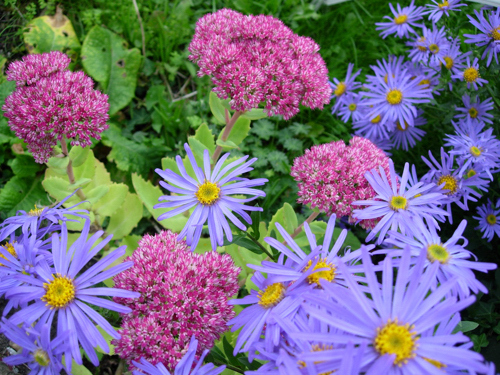 This is a great doer as its foliage is still looking good in September – see below, half way through September. I planted Viola cornuta ‘Alba’ and ‘Alba Minor’ throughout the rose garden, as well as lavenders. 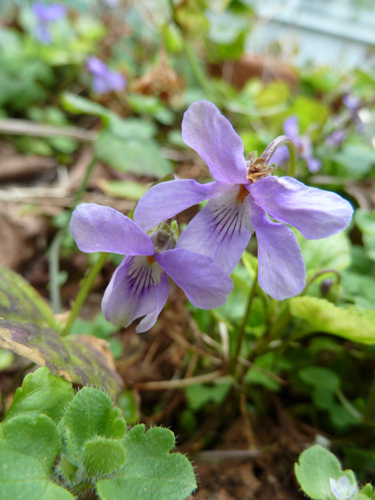 Although not specifically planted in the rose beds, the sweet violet (Viola odorata) pops up throughout March and April there. Here it is on 31 March 2014. Another early blue flowering plant is Veronica umbrosa ‘Georgia Blue’, a lovely spreading little speedwell with beautiful bronzy leaves and early blue flowers. I have this planted to the right of the path through the rose garden. Of interest all year it likes our chalk, good drainage, and lots of sun. It also likes to root into the hoggin path making it easy to propagate! 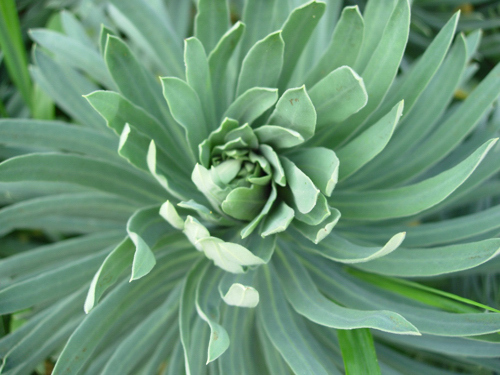 It can be flowering at the beginning of March. Here it is mid-April. 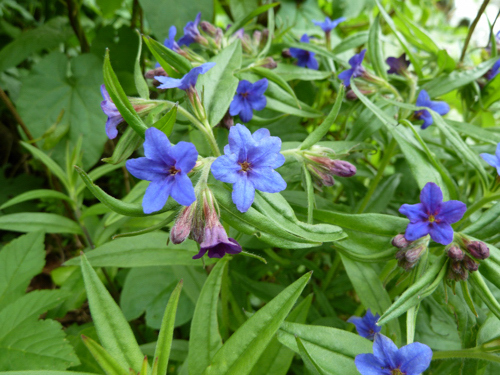 Also making its lovely blue mark early is Lithodora diffusa ‘Heavenly Blue’ which also anchors itself into the hoggin path so I can spread it around. 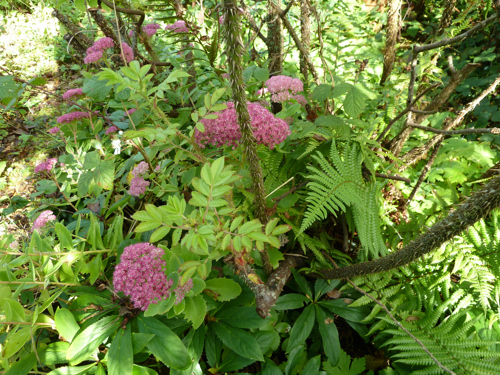 Here it is also flowering away mid-April at the edge of the left hand bed facing the red Rosa 'Grootendorst'. I have many aquilegia planted around – seedlings from named originals that over the years have reverted closer and closer to the original granny’s bonnets. I try to keep only the good colours, doubles etc, and still have one Aquilegia vulgaris 'Strawberries and Cream” plant, whilst all my “Nora Barlow” and relations have reverted. Such a shame, as I had one that I thought should have been named after that well know Irish stout it was such an impressive double black and white. 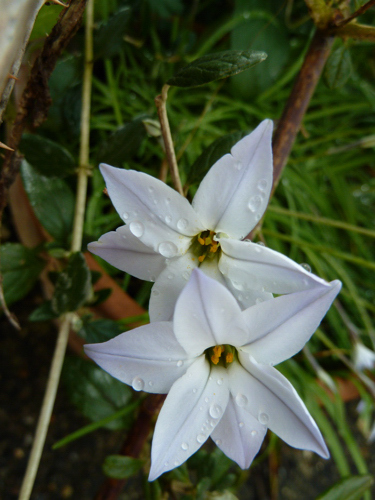 They keep the interest going into May, together with early flowering white star flowers – Ipheion uniflorum possibly ‘White Star’, dug up in clumps from my husband’s mother’s garden by her sister, and passed on to her son and daughter-in-law for their garden, and passed back to us in clumps from their garden. Here they are in flower at the beginning of May. Another early white flowering plant is the ox-eye daisy, (Leucanthemum vulgare), which I started off in one bed, and has moved itself all round the rose garden. 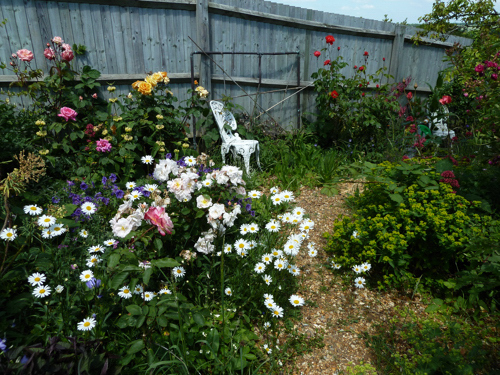 You may have noticed it surrounding a low white rose in this picture taken at the very beginning of June 2011 that I showed you last month. In this picture above you can see another patch of Geranium ‘Johnson’s Blue' behind the ox-eye daisy, with bottom right Alchemilla mollis, and above that a patch of Euphorbia oblongata to keep up the zingy citrus lime colour. 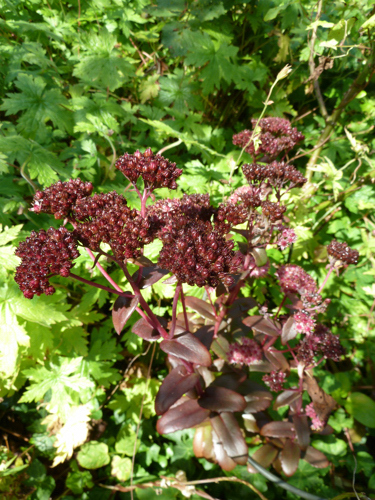 You may be able to see bottom left the darker leaves of a purple Eupatorium – Eupatorium maculatum (Atropurpureum group) ‘Purple Bush’ just coming through. 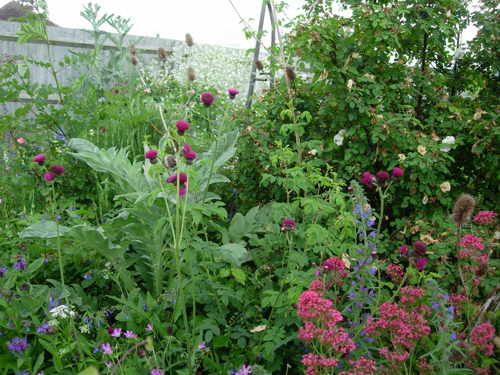 This was part of my “Hadspen inspired” section of that bed – I planted the Eupatorium there so that the big apricot hybrid tea rose would have purple foliage either side of it in late summer when it might be in its second flush of flowers. Unfortunately the black elder did not thrive, and after a few years of slow growth, simply did not make it through one of the harsh winters where the ground was frozen solid for more than two weeks. 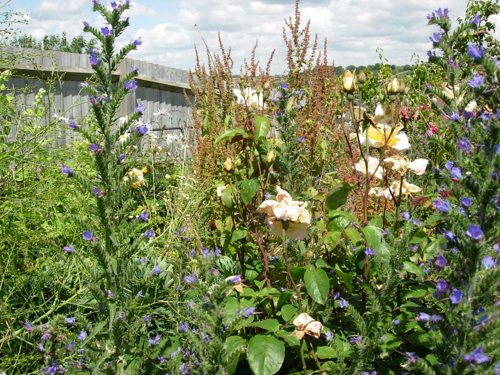 You can see at the right hand side the blue spires of the vipers bugloss (Echium vulgare) which is a long flowering plant, so whilst it looks fabulous against the Crambe cordifolia in June, it is still giving flowery interest as well as grey/green foliage right into September. The Sisyrinchium striatum to the left of the Geranium × johnsonii 'Johnson's Blue' is only shortflowering, and I try and plant white foxgloves to come on after they stop (you may just be able to see the spire of one just in front of it), but as you all know foxgloves go where they want, and both the white and the purple grow in the sunniest spots (!) of the rose garden at will. Though you can’t see it in this picture just below the Geranium is a big patch of thyme (Thymus vulgaris) bordering the path, and beside it an English lavender bush. All along the edge of that bed I planted alpine strawberries - Fragaria vesca ‘Mignonette’ – grown from a packet of seeds. The idea being you would stroll along the path picking ripe fruit as you went. These give interest for a long season with their white flowers in spring and then fruit over a long period. At the back of that border behind the Eupatorium I planted Lavandula viridis so that the lemony rabbits ear flowers would complement the alpine strawberry flowers. Towards the back of that border behind the copper arch I have a line of Heuchera villosa 'Palace Purple' running alongside the path under the moss rose Rosa ‘William Lobb’. 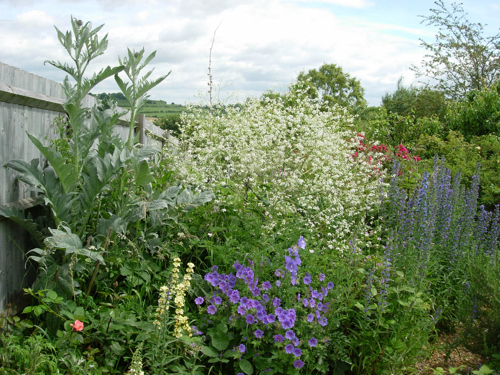 As we head into July here are two shots showing the back of the left hand border. 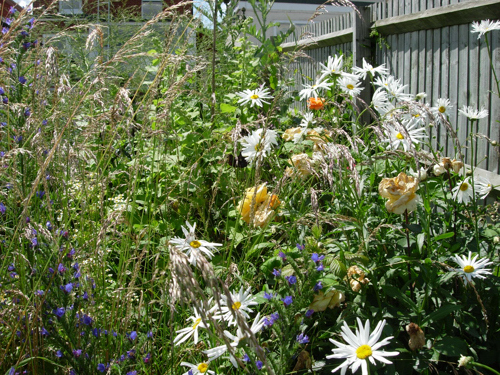 In the first you can see the grasses coming into their own on the left, and the Leucanthemum x superbum on the right which flower through July, and in the second a perhaps surprising choice – the seedheads of sorrel (Rumex acetosa) accenting the apricot hybrid tea rose. In both, the vipers bugloss is still prominent. And here is the Sedum underplanting the Rosa 'Grootendorst' with fern Dryopteris filix-mas on 28th September 2017. 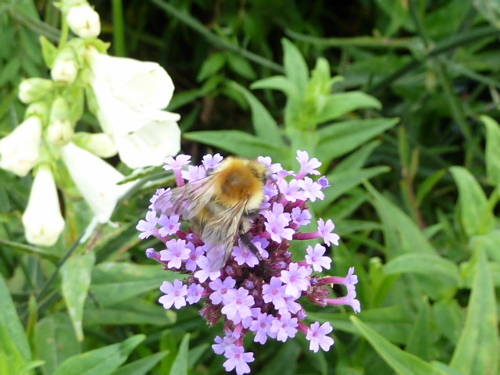 Although I have tried Verbena bonariensis many times it does not overwinter well here so has to be replenished each year, not therefore becoming a very big clump. 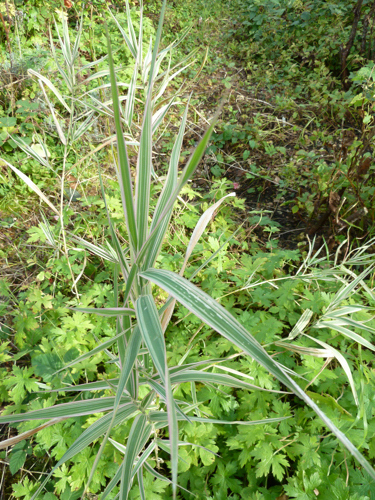 To compliment the second flowering of roses, especially the lovely pink one in October I have also planted a white phlox, (and a pink one with a dark eye which has mysteriously disappeared), and the dwarf white stripe bamboo Pleioblastus variegatus, see below. This is most noticeable later in the season, but is a presence all summer. 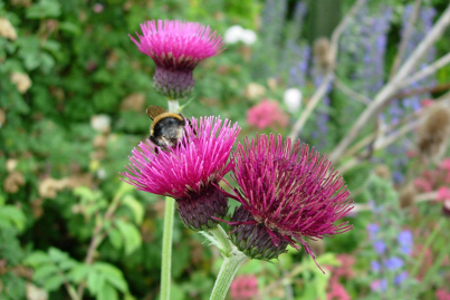 You may notice that apart from a couple of spot plants (phlox, eupatorium) in the main the continuous interest into later summer comes from cutting back herbaceous perenials for a second flush of flowers or leaves. As they are cut I move pots of cannas, bedding dwarf dahlias grown from seed, or other seasonal flowers in pots into the spaces to give spot colour. Next time, planting a tiny winter bed. 1 Comments To "On a Chalk Hillside January 2018"